Chances are you know the guy. If you haven’t met him, you know the kind. He’s the one from your past who you kind of like, but nowadays it’s perfectly okay that he lives somewhere else. Then, without warning, he turns up on your doorstep and thinks there’s no problem with moving in for a day or two. 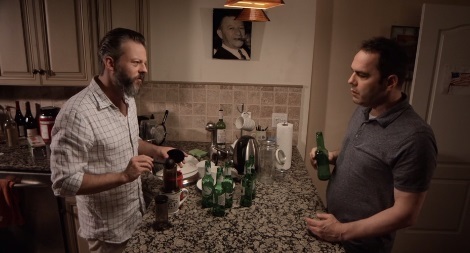 In writer/director Serge Kushnier’s bittersweet indie comedy The Idea of Manhood, a freelance writer from D.C. called Sandy (Karl Bury) has had a moment of clarity. He’s finally called it quits. “I’m done with people,” he’ll later explain. He intends to disappear; explore the country. He’ll be a present-day, middle-aged Easy Rider on four wheels looking for America. But before he does that, he’ll stop off in NYC to pay a weekend visit to an old buddy he hasn’t seen for a while. His buddy is Jacob (Jeremy Kushnier), now married with two girls and living what should be a contented life in Manhattan. From the opening shots showing the state of the kitchen – empty beer bottles on the kitchen counter, slices of lemon drying up, an empty liquor glass on a table-top – Jacob has had a really late night. Having someone ringing the doorbell and calling, “Morning, princess. Guess who,” in the speaker during the early hours doesn’t help. After forcing himself out of bed and wiping the sleep from his eyes, Jacob opens the door and lets Sandy in. “You’re here for the whole weekend?” asks Jacob, still in a sleepy stupor. “That’s all right, isn’t it?” says Sandy, a statement more than a question as he helps himself to an early morning beer from the fridge, which, in addition to housing more beer, is full of restaurant left-overs and carry-outs. If there’s one thing clear from the look of things, and from the look of Jacob, the guy is currently alone and living the bachelor life. As far as Sandy is concerned, with his buddy’s wife and the kids gone, turning up on this particular weekend is perfect; the timing couldn’t be better. What follows is a day spent with two friends from the past catching up with their stories-so-far, talking through their differences, arguing the pros and cons of where they currently stand, often disputing each others’ theories on what needs to be done, and ultimately pondering the next step. 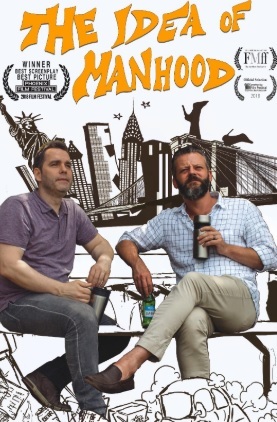 The Idea of Manhood is essentially a two-man play, beginning and ending with the conversational conflicts between Jacob, who repeatedly insists he’s happily married when it’s clear he’s not, and the single Sandy, who believes he’s finally getting a handle on things while feeling the need to continually share his points of view. 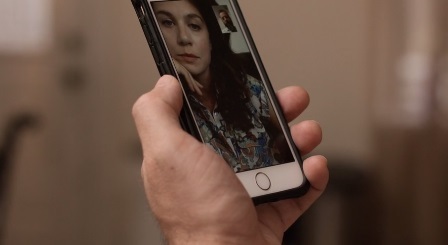 “I’m a freelance writer,” he states, “Why not be a freelance person?” There’s also a brief inclusion of Jacob’s wife Carly, seen temporarily on a cell phone (Melanie Merkosky, who also co-produced the film). During a call, the humorless Carly berates her husband for not getting the drier fixed quick enough. She even calls him an idiot. “I want my drier fixed before I get home,” she declares. But in between the unwarranted opinions of Jacob and the defensive returns of Sandy, Kushnier opens up the middle with the introduction of the younger and altogether pleasant Molly (Elizabeth Masucci) and her two equally younger friends, Hannah (Meg McCrossen) and Andrew (Thomas Sullivan) who drop by Jacob’s place for an afternoon backyard party of Beer-Pong. A lot of Kushnier’s good humor emerges during the conversations when all five characters get together. 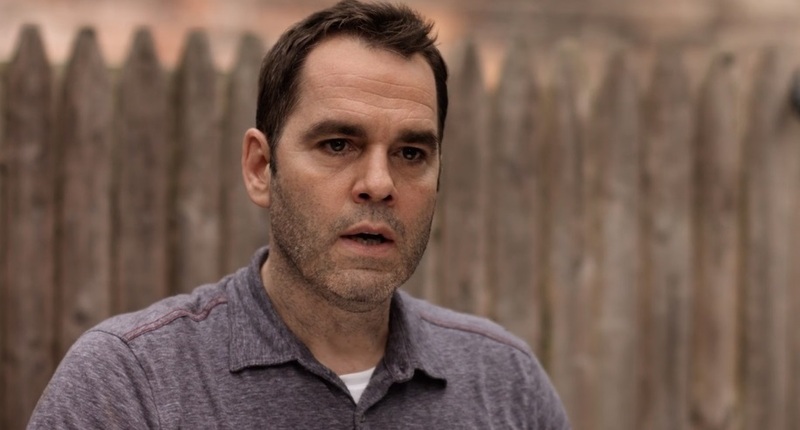 For his personal amusement, while knocking back the beer, Sandy engages the younger three in a supposed true story he’d heard about a young kid called Kevin who was left behind by accident in his Chicago home while the rest of the family flew to Paris for a vacation. “And this is where it gets insane,” he adds when he knows he has their attention. “There were these two burglars, and they were casing Kevin’s parents’ place for, like, two weeks.” It’s only when he uses the words home and alone that Molly realizes they’re being played. The somewhat less-than-aware Hannah remains confused, while Andrew appears unconcerned either way, preferring to check his phone for messages rather than listen to a story, leading Sandy on to another mini-rant. “What the hell’s with the phone?” he asks, wanting to know what’s the younger sets obsession with checking messages every time there’s a lull in the conversation, or the taking pictures of feet dangling in the pool and needing to share them with others. Particularly effective is the film’s use of compare and contrast. Sandy and Jacob could not be more opposite when it comes to outlook. Carly’s bitching at her husband makes Molly’s pleasant demeanor all the more attractive. Molly’s sharp mind is made evident by the overall clueless nature of her friend Hannah. There’s even contrast in the film’s sound that director Kushnier uses to good effect. The noises of a bustling city run as a backdrop to the lighter conversations played out in the backyard, but when Jacob and Sandy close that door for a more private and serious heart to heart, all noises are blocked out. In the true spirit of independent film making, The Idea of Manhood was shot over a nine-day period in New York. Plus, two days before shooting her scenes, Elizabeth Masucci broke her foot, which is why you’ll see her Molly hobbling on crutches. But instead of delaying a schedule, director Kushnier used the accident to its best advantage. When Molly excuses herself from the backyard party, Jacob lends support by holding her waist with both hands as she steps up through the door. The move is considerably more intimate than that of someone who was simply a casual friend, further advancing Sandy’s theory that Jacob is sleeping with the young woman while his wife was away. With a running time of only 72 minutes, there’s not a moment of padding in the script. By the film’s conclusion, not only do you like the two lead characters (and the men who play them) but you find yourself wanting to know more. Ultimately, even though he may annoy and his honest observations are not always what you want to hear, if Jacob needed anyone to turn up unannounced on his doorstep in the early hours of the morning, he could not have asked for a more necessary friend at that point in his life than Sandy.